Here’s an affordable, easy recipe to make baked beans in tomato sauce using either a crock pot or an Instant Pot. 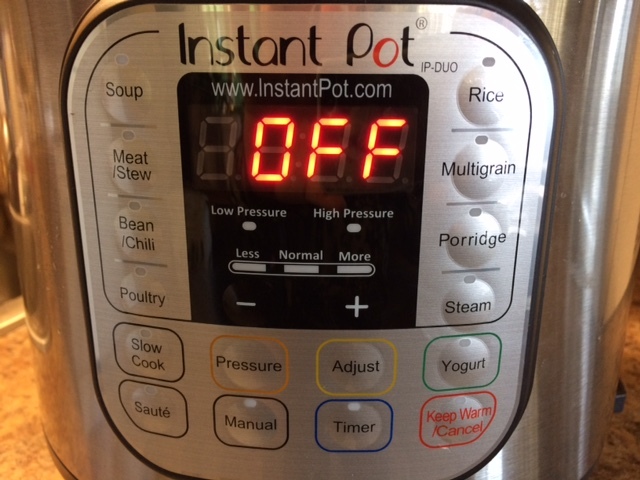 If you haven’t heard of an Instant Pot, it’s a programmable 7 in 1 pressure cooker. It’s also a rice maker, a crock pot, a yogurt maker, steamer, sautés, and warmer. I was looking for a new rice cooker and also thinking it might be time for a new crock pot (slow cooker) and the Instant Pot is perfect for me. I’ll start off with the directions for baked beans in tomato soup sauce using the Instant Pot, and the crock pot instructions will follow. The ingredient list stays the same. 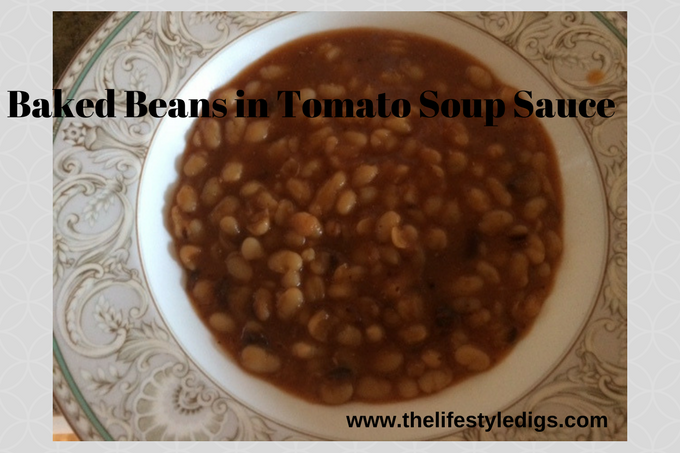 Start off deciding whether you want to use pinto beans or navy beans for your baked beans in tomato soup sauce meal. Dried beans are inexpensive and I use either of these beans, it depends on what I have the most of at the time I’m making the baked beans in tomato soup sauce. 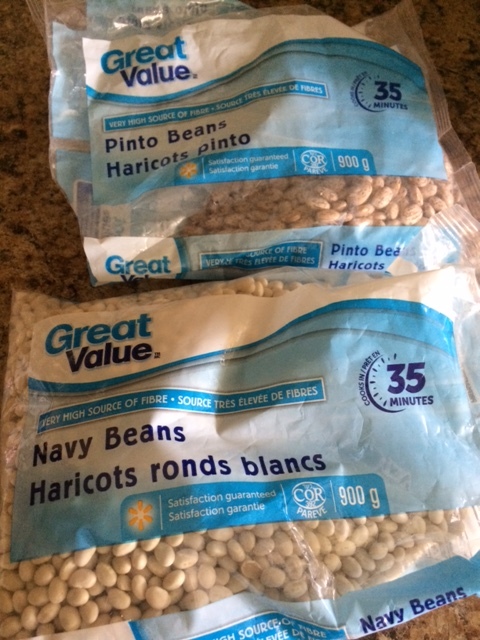 Today I’ll be using navy beans. 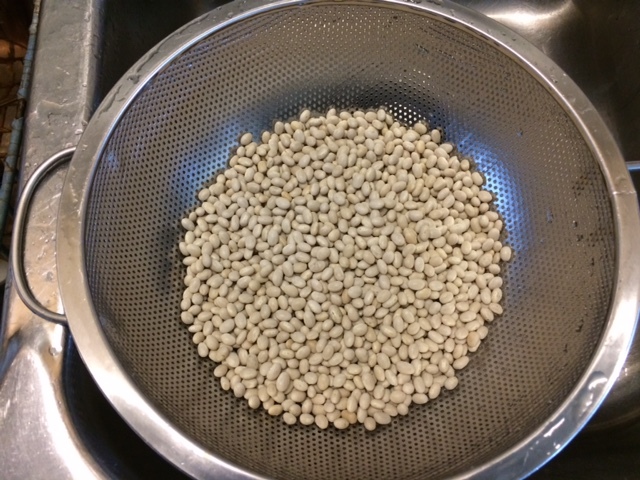 Measure out one pound of dried beans, about 2 cups, and pour into a colander or strainer. Pick through them looking for dirt clumps, little stones, split beans, or beans that look ugly or shriveled. Then rinse them with water. Dump them into the Instant Pot and add water. Add enough water to cover the beans plus an extra inch or two of water on top of the beans. Turn on the Instant Pot and fit the lid on. It will make a musical tone when you have the lid on correctly. Ensure the vent/steam/seal valve is pushed to the sealing position. Press the manual button and then use the -/+ button to adjust the time to 30 (minutes). In about 10 seconds the 30 will change to On. 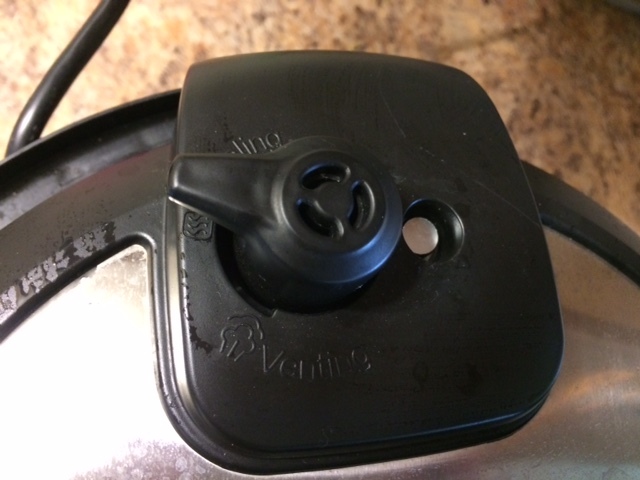 It takes the Instant Pot about 10 minutes or so for the pressure to build up and the valve will pop up to the sealed position. Then the display returns to 30 and the countdown begins. After 30 minutes the Instant Pot will beep to announce it’s finished the cycle. Wait about 10 minutes, then push the Keep Warm/Cancel button to turn it off. This process for the pressurization, cooking, and depressurizing, takes about one hour. Grab a pair of oven mitts and turn the sealing valve to vent. In a few seconds the valve will drop down. If you’re not in a big hurry, you can leave the Instant pot in the keep warm position and wait for the valve to drop down on its own, about 20 minutes or so. Keep those oven mitts on, lift out the stainless-steel pot, and pour out excess water into the sink, being careful you’re not dumping out beans. Eyeball the water until you think you have about a soup can’s worth of water in the bowl and then put it back in the Instant Pot. Add a teaspoon of salt, one can of tomato soup, a tablespoon of mustard powder, and about a cup of brown sugar. Stir it and put the lid back on the Instant Pot. And here I’d like to add that you can change the ingredients to what you have on hand in the house. If you don’t have mustard powder, but have mustard in the fridge, give it a squirt. Substitute brown sugar with molasses or maple syrup, or a combination of any of those sweeteners. Don’t cut back too much on the sweetener or the beans become indigestible and unpleasant. Make sure the vent is in the sealing position and push the Bean/Chili button. The number 30 will come on the display screen for about 10 seconds and then change over to On. After about 10 minutes or so when the Instant Pot is pressurized and the valve has sealed in the up position, the 30 will return to the screen and start counting down. 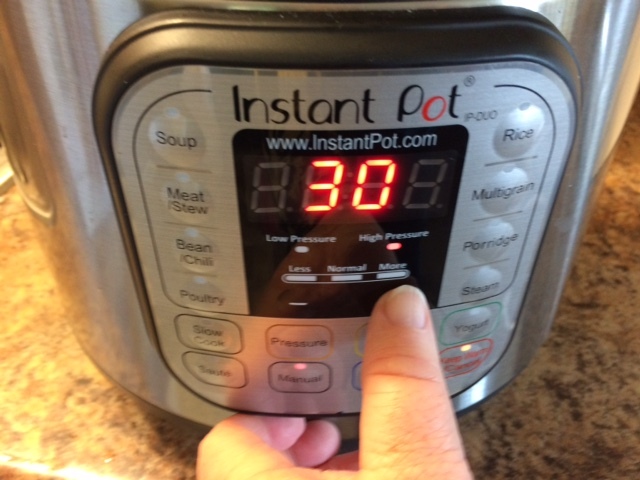 After 30 minutes the Instant Pot will beep to announce the cycle has ended and go into the warming mode. You can leave it for awhile to keep warm, or wait at least 10 minutes and then manually switch the sealing vent back to steam to depressurize the pot. 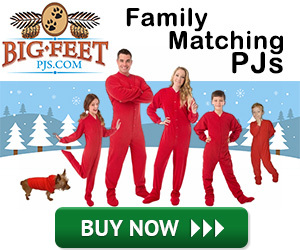 Again, wear oven mitts to avoid a steam burn. Once the Instant Pot has depressurized, the lid can be removed, and the baked beans in tomato soup sauce can be served and eaten. This whole process takes about 2 hours. It’s easy work. The most work you’ll do is add ingredients to the pot and pushing buttons on the Instant Pot. I like to bake cornbread to accompany this bean recipe, but that’s optional. Here’s an easy Golden Sweet Cornbread recipe I often use when I’m making baked beans in tomato soup sauce. Here’s a tip if you don’t use cornmeal too much: but it in bulk and then put it in the freezer. 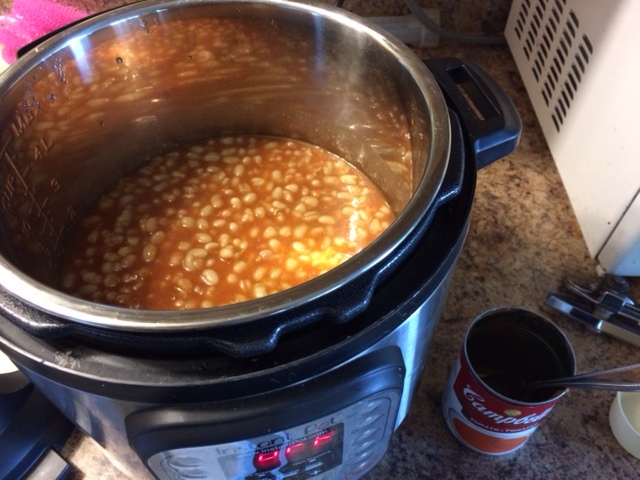 Now for those who prefer to use their slow cooker to make baked beans in tomato soup sauce. 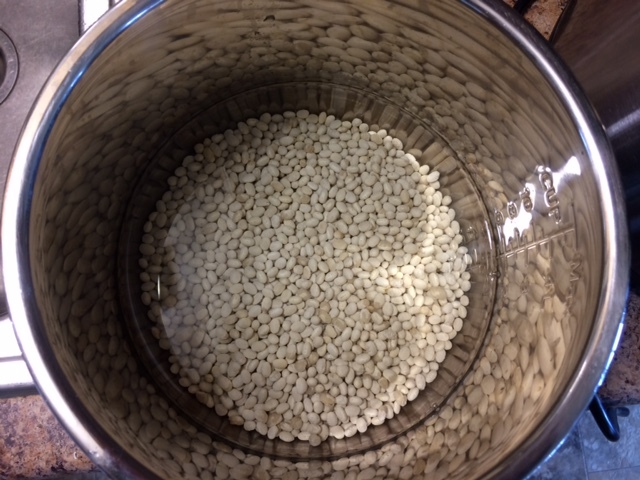 Before you go to bed, put the rinsed beans into the crock pot and add 4 or 5 cups water. Put it on the Low setting. In the morning, add the can of tomato soup, salt, mustard, and brown sugar. If needed, add more water. Stir. Let it sit on low for about 8 hours. The baked beans in tomato soup sauce will be ready by dinner! If you’re looking for a slow cooker recommendation, I’ve been happy with my Hamilton Beach crock pot. 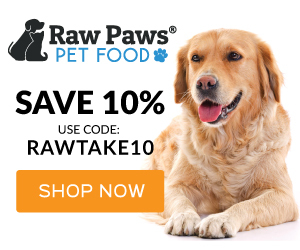 Note – this post contains affiliate links. If you click and make a purchase I’ll make a small commission for the referral. If you’re a single and don’t want to eat this 3 or 4 times for the next couple of lunches and dinners, it freezes well. I put mine in single portions in freezer bags, pushed it flat to get the air out and for easier stacking in the freezer. To defrost, put it in the fridge the night before. Once defrosted, I scooped it into a bowl and put it in the microwave for 90 seconds, stirring midway, and it was great! Did you try this recipe? 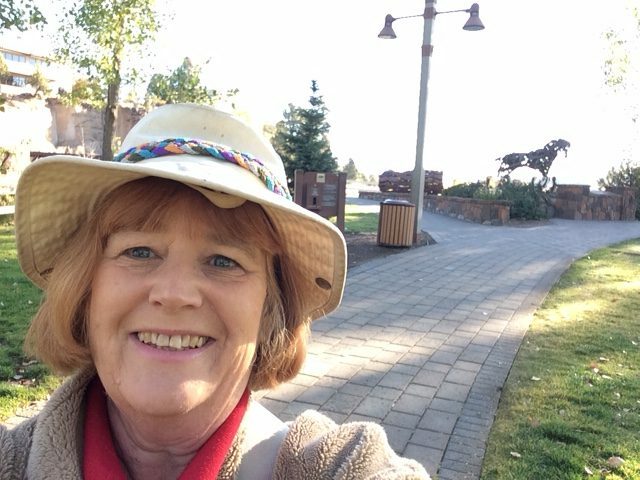 How did it go for you?